RNB Global University in an endeavour towards further growth and industrial participation through its flagship industrial visit of B.Tech (II Semester) embarked on an industrial visit with the objective of providing the students an exposure to analyze and correlate their academic curriculum with real life issues/ applications. On 3rd of February 2017, the students visited International Engineering & Technology Fair 2017, “Indian Design Show” at Hall No 12A, & “Logistics Show- 2017” Hall No. 12B at Pragati Maidan, New Delhi. 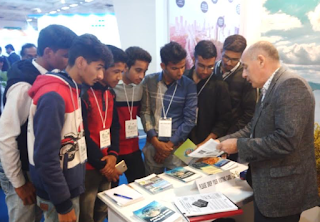 It was an unique opportunities to the Engineering students to be a part of International Indian Design Show, highlighting the role & importance of Manufacturing, Design, Metals & metallurgy in the Indian Economy & Worldwide. Such tours are the platform of exposure to the practical notion of futuristic planning at professional institutes and add to the explicable abilities of the candidates. Students had a very good interaction with the delegates of different industries like Scottish Development International, Kirloskar Brothers Limited, L&T Limited, JCB, IIT-Kharagpur, IIT-Kanpur etc. to enhance their knowledge as well as checked the career opportunities after completing the course in India & Abroad. After visiting the IETF-2017 the students also visited the Old Fort of Delhi, Connaught Place, where they enjoyed to the fullest. With that at RNBGU we move from milestone to milestoneas the university is committed to providing the best industrial experiences to its budding talent.